The U.S. Chemical Safety and Hazard Investigation Board is examining potential dust sources that might have contributed to the fatal May 2017 explosions at the Didion milling facility in Cambria, Wis. In an ongoing investigation, the agency is reviewing witness testimony, post- incident damage patterns, and computer modeling of the propagation of fire and explosions in the mill. Moments before the explosions, workers reported seeing dust clouds suspended in the air inside the facility. The explosions occurred at night, when only 19 workers were present. Five of the workers died, and the other 14 were injured. The Didion incident prompted CSB to issue a “call to action” on combustible dust. The agency sought comments on the management and control of combustible dust from individuals and entities involved in the safe conduct of work within inherently dust-producing environments. An article in NewsWatch discusses the agency’s efforts related to combustible dust. The incident at the Didion facility was one of six dust incidents that occurred in 2017, according to CSB’s incident screening department. 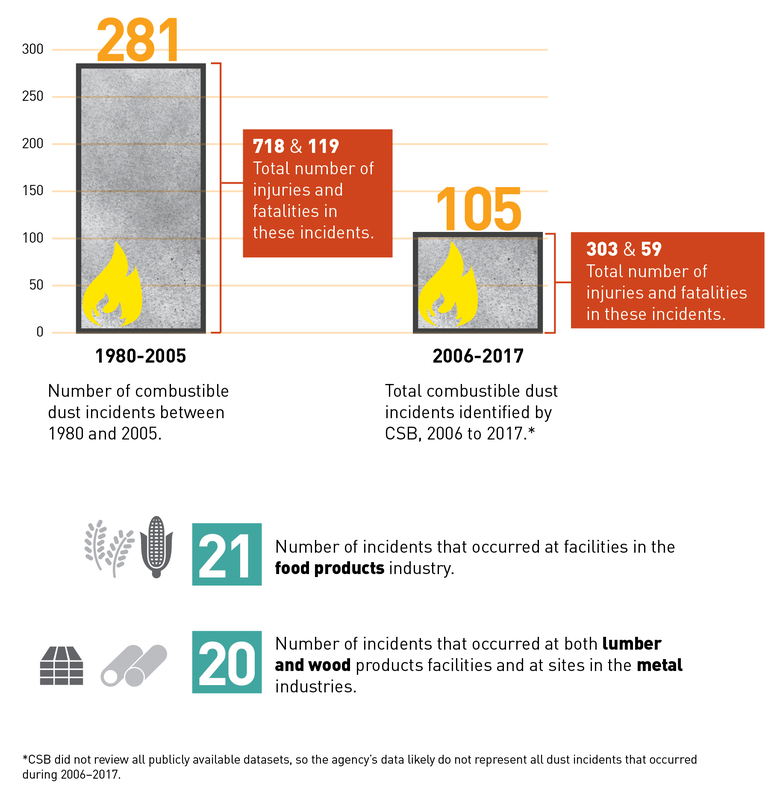 The agency recently released data on 105 dust incidents that occurred between 2006 and 2017. Information based on this data appears below. Chemical Safety and Hazard Investigation Board: Combustible Dust Hazard Investigation (November 2006). 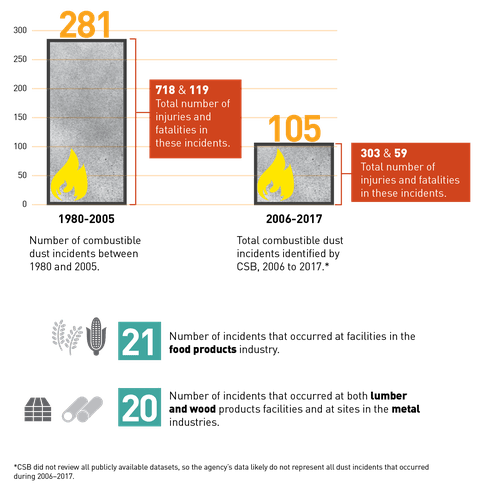 Chemical Safety and Hazard Investigation Board: “Dust Incidents, 2006–2017” (PDF, October 2018). Chemical Safety and Hazard Investigation Board: “Factual Investigative Update: Didion Milling” (PDF, April 2018).